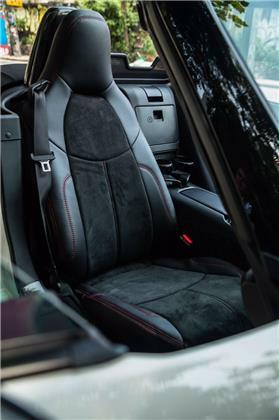 CM-SC1-ND-B - CarbonMiata seat covers - MiataRoadster - Stay tuned with MiataRoadster! TO ORDER MULTIPLE CARBONMIATA PARTS WITH COMBINED SHIPPING CONTACT US WITH A LIST OF PARTS THAT YOU WANT TO ORDER AND WE'LL SEND YOU A QUOTE. CM-SC1-ND-R $299.00 Notes PLUS SHIPPING. CM-SC1-ND-BL $299.00 Notes PLUS SHIPPING. CM-SC1-ND-G $299.00 Notes PLUS SHIPPING. CM-SC1-ND-GR $299.00 Notes PLUS SHIPPING. CM-SC1-ND-O $299.00 Notes PLUS SHIPPING. CM-SC1-ND-P $299.00 Notes PLUS SHIPPING. CarbonMiata seat covers are made of high quality leather and faux alcantara that fit over the OEM seats.